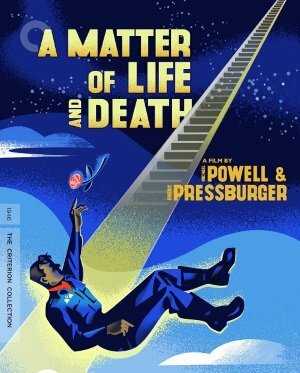 Michael Powell and Emerich Pressburger’s A Matter of Life and Death (1946), originally released in the U.S. as Stairway to Heaven, is as gorgeous and romantic as films come. The film opens with a celestial prologue and narration providing a sense of cosmic comfort of someone watching over it all, of some divine authority in charge. It plays like the British answer to the opening of It’s a Wonderful Life, which came out the same year (is it coincidence that the post-war era inspired such a need for heavenly affirmation? ), but immediately swoops down from the majestic calm of the stars into the terror of World War II and a bomber pilot giving his farewell to life over the wireless as his plane burns furiously around him and he prepares to make a blind leap without a parachute. Powell gives the scene terrible beauty—the wind whips the cabin, the fire flickers around his face, the clouds have a texture so palpable they look like you could step out into the sky and walk to heaven on them—and an emotional power to match. Peter Carter (David Niven) is resigned to his fate but his heart beats with the desperate passion of a man determined to embrace every last sensation in the final seconds of his life. That combination of adrenaline-powered strength and mortal vulnerability gives him the permission and the need to embrace, if only through voice, the American girl (Kim Hunter) at the other end of the wireless. And she falls just as surely in love with him.